"This is the day that the Lord hath made; let us rejoice and be glad in it!" 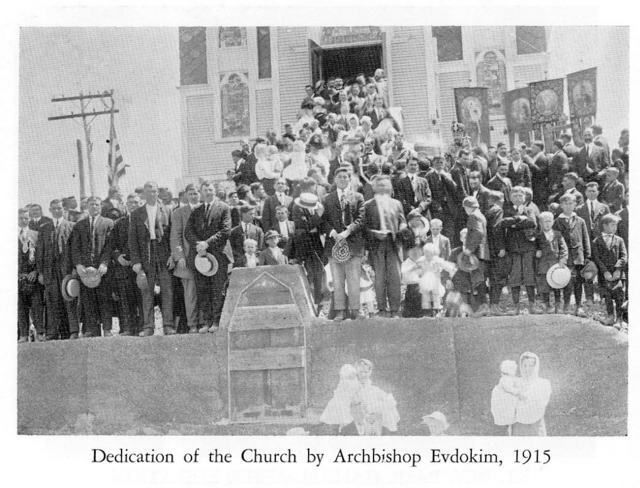 The joy felt by all of us, as we rejoice in nearly 100 years of Orthodoxy in Frackville, cannot be expressed. Our hearts are overflowing and we radiate pride and humility as we thank God for all that we have in Frackville. The history of this parish is in many ways similar to the history of other Orthodox parishes in America. Most of them were organized by small groups of immigrants from Galicia; others were Sub-Carpathian Russians or Austro- Hungarian. Difficult economic conditions and religious and cultural persecutions forced these people to leave their native lands. Here in America, they found hard and often dangerous work. As fruits of their labor, they improved standards of living and, more important, they had complete religious freedom. The dawn of the 20th century found a few Slavic families in Frackville and Maizeville who were determined to worship God in a church that maintained a canonical attachment to their Mother Orthodox Church in Russia. In 1914, twenty-one men gathered at the home of Michael Halenda in Frackville. Their purpose was to effect the organization of a Russian Orthodox Church. Gathered together were the following: Artim Billie, Harry Billie, Peter Billie, John Cuttic, Steve Cuttic, Michael Halenda, Samuel Kessock, Michael Kohudic, Wasil Kuchta, Thomas Lehotsky, Frank Madzi, Stephen Malinchock, John Malinchock, Julian Mucha, Theodore Patrick, Michael Polansky, George Pribulick, Wasil Roman, Roman Ruschak, Frank Sowchak, and Gabriel Supko. May their memory truly be eternal for their labors and love for the Holy Orthodox faith. These men, with their families, began holding services in a church on Broad Mountain Avenue (now the Annunciation B.V.M. Church). The Very Reverend Joseph Fedoronko and Professor Elias Boruch from the Orthodox Church in Coaldale rendered their services during these initial months. Fr. Andrew Vanyush was appointed as first pastor and under the guidance of the newly appointed Fr. Andrew a plot of ground on the corner of South Lehigh Avenue and Chestnut Street was purchased. After a hard day’s work in the mines, the men, together with many neighbors and friends, gathered at the future church site to excavate the ground and build the foundation. It should be noted that some of the men from the parish mortgaged their homes in order for the church to be built. 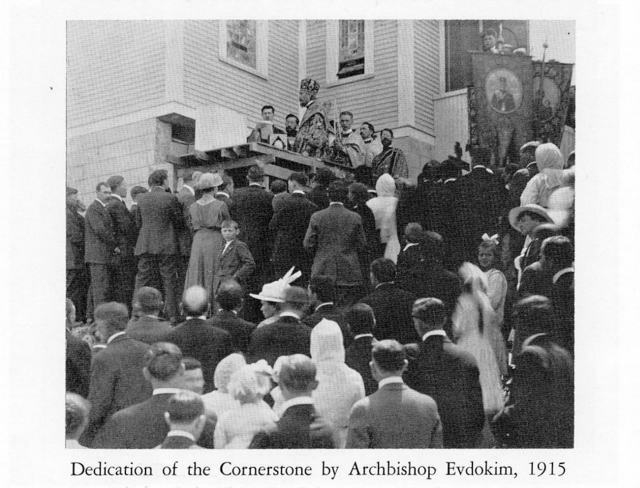 On June 15th, 1915, the cornerstone was laid and blessed by Archbishop Evdokim, the ruling primate of the Russian Orthodox Church of America. The church was named the Holy Ascension Russian Orthodox Greek-Catholic Church. From then on, the work progressed rapidly so that by the end of 1915, the present church was consecrated. Fr. Andrew Vanyush served Holy Ascension for one just year and the Very Reverend Basil Repella took over from 1916 to 1920. Then the Very Reverend John Zitinsky served as pastor from 1920 to 1924. During this decade Holy Ascension continued establishing itself in the area purchasing land for a parish cemetery in 1917 and in 1922 the parish rectory was built. They also continued their work on the interior of the Church with its painting and the purchase of 3 new bells. In 1924, the Very Reverend Basil Gambal was appointed to serve Holy Ascension and growth continued. In 1927, Metropolitan Platon blessed the newly painted icons. 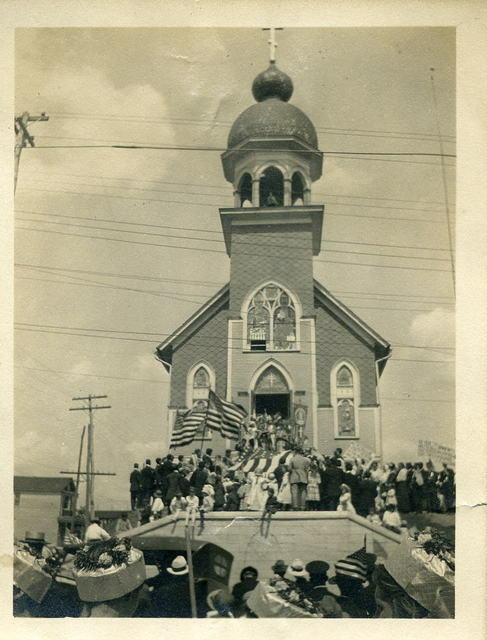 To add to the beautification of the church, a crystal chandelier was purchased, and the domes were covered with copper, while the crosses were enveloped with stainless steel, remodeling of the church occurred throughout the years. Extensive gold was added to the walls. The Holy Icon of the Crucifixion was painted on the ceiling of the church. Fr. Basil served Holy Ascension from 1924 until 1968 and during his 44 years at Holy Ascension, he and the parishioners witness the growth of the parish as well as improvements of the church. Fr. Basil, with the help of God, strived to make Holy Ascension Orthodox church one of the finest in the region. Parish life would progress rapidly under Fr. Basil's guidance . Several renovations occurred in the early 1960's as the church interior was refurnished, the pews repainted, the main body of the church and altar were carpeted and extensive gold leave stenciling was added to the walls which reflected the overall life of the parish. During these renovations new iconography was done. The icons were done by one of the finest iconographers in the country, Serge Bodasiuk, of New York City. His painting of the icon of the feast of the Holy Ascension was written as the centerpiece on the ceiling of the church. In September 1968 Fr. Basil retired and the Reverend Paul Ropitsky was assigned to serve Holy Ascension. It was under the leadership of Fr. Ropitsky that the parish took the shape that it has today. By 1969, the original rectory was dismantled, and a newly constructed one was dedicated in 1970. Over the next three decades, the outside front of the church and the church hall was remodeled. New stain glass windows and new carpeting was installed. The pews were refurnished and the interior of the church and the domes were repainted and refinished. An illuminated sign on the north corner of the church grounds was erected, opening our doors to the community. A parking area was also created for parishioners and visitors. In 2003 the Very Reverend Paul Ropitsky, after many years of faithful service retired and the Reverend Barnabas Fravel was assigned here unil January 2007. In May of 2007, Reverend Matthew Cantrell was assigned to Holy Ascension until May of 2009. The V. Rev. James Jadick is now the present Rector of Holy Ascension. The parish began efforts towards parish renewal, re-education, and revitalization, as well as active evangelization and community involvement. The Holy Ascension Orthodox Church, here in Frackville, remains dedicated to and affiliated with the Orthodox Church in America—the Diocese of Philadelphia and Eastern Pennsylvania. Throughout the years, the Holy Ascension Orthodox Church has provided strong support for St. Tikhon’s Seminary. The seminary is located within this diocese, and a special bond is evident since seven sons have been educated at St. Tikhon’s and have been ordained as priests: Gregory Dudash, John Kuchta, Joseph Martin, Dimitri Rachko, Michael Rachko, John Rachko, John Stefero and James Weremedic. As we celebrate over 90 years of Orthodoxy now, we recognize that the Lord has blessed His faithful at Holy Ascension Orthodox Church in Frackville. We pray his blessings continue, as we rededicate ourselves to bless His Holy name. We humbly acknowledge the faithful labors of our fore-fathers in establishing this congregation and are aware of their sacrifices, patients, understanding, hard work, and labor by which this House of God became a reality. It is for this we are eternally grateful. It is also with deep reverence and holy awe that we proclaim above all the miracle that the “Lord hath wrought,” and continues to fashion here in Frackville.